Today's project happens to be the gift bag I am giving to my girls this morning with a few goodies in it. I used my Let's Toast Pull Tab Add On Die set from Lawn Fawn to make this monster pop up out of the grass. I folded the legs of the monster to make him short and then when you pull the tab he pops up and gets tall. It's too cute! I also attached a sentiment to the pull tab that is revealed when he pops up. Just putting a couple little things in here for my girls. I know these bags will bring them a smile. I hope you have a fabulous Valentine's Day and get to show love to someone. You can watch the making of this bag in the video below. If you do not follow me on Facebook you can find my page HERE. I do live videos every Monday and Friday night at 8pm MST. If you want more ideas with the Let's Toast bundle of products by Lawn Fawn you can get my Let's Toast Tutorial HERE. And don't miss out on this month's tutorial, Sending My Love. I have linked the supplies used at the bottom of this post for your convenience. Please let me know if you have any questions, I am glad to help and love to hear from you. Introducing the Carrie Stamps February 2019 Stamp Set of the Month...... Sending My Love by FSJ! This stamp set earned it's place as stamp set of the month of February because I love that typewriter! Two other reasons I picked this set as my stamp set of the month is because it has several sentiments and a coordinating die set. So, what can you expect from me each month with my Stamp Set of the month? TWO fabulous things just for you! Every Monday night at 8pm MST I will do a live demonstration with the Stamp set of the Month on my Facebook page. Be sure to like and follow my page as well as request to be notified when I go live so you don't miss any of my live videos. A tutorial with 4 exclusive projects designed by me with the Sending my Love stamp set of the month. The exclusive projects are ones that only those to purchase the tutorial will see. Included in the purchase of the tutorial you will receive a full color step by step PDF tutorial to print out or view on line as well as a full video tutorial where I create all four of the projects start to finish. And this tutorial is only $5. Click the image below to purchase your Sending My Love tutorial for just $5. Upon receipt of payment I will email you the PDF and private video link. So, how would you like to see the Sending My Love stamp set on a cute project? This is the project I shared on my Facebook Live demonstration on Monday night. It's a Valentine mail box. Complete with little valentines in baby envelopes to put in the mail slot. Below you can watch the making of this box incase you missed me live. Below I have linked all the products I used to make this box. If you have any questions about this project or the Sending My Love tutorial please ask. If you are interested in my other stamp set of the month tutorials you can see January's HERE. Affiliate Links have been used at no cost to you, thank you for your support. The February Happy Stamping Box is now available for order. You are invited to join me in creating these Mermaid themed cards with some fun Distress Oxide backgrounds. All from the comfort of home with the Happy Stamping Box and virtual stamping class. The February box features the Mermaid Kisses stamp and die set. Each card has a unique Distress Oxide background. These ethereal cards are versatile and can be used for any occasion. From this box you will be making 5 cards, and you have an opportunity to earn a 6th BONUS card for FREE! Register TODAY, 1/30/19 and you will automatically get a 6th project kit for FREE. Or invite a friend, and when you and your friend register you will both get the BONUS project kit for FREE, all you need to do is email me your friends name at carrie@carriestamps.com. Hurry Registration ends 1/4/19. Each of the projects in this kit are unique creations, designed by me. I will be teaching you how to making some cool backgrounds using Distress Oxide ink. And the Bonus card is a fun shape card that I know you are going to love! With the purchase of your box you will get an invitation to my private Facebook page, The Happy Stamping Box. There you will have access to a printable PDF tutorial for the projects. And this page is where the LIVE online class video will take place. Earn a 6th Bonus Project by registering TODAY, 1/30/19! You will need to have some basic supplies on hand to make these projects. Below I have shared what I will be using. Feel free to use what supplies you have on hand or click to shop for exactly what I will be using, scroll to the bottom for clickable links. Supplies needed: Black stamp pad, markers or pencils to color in your stamped images, water brush or small paint brush, white gel pen, baby wipes, paper towels, glue, glue dots, foam squares and or foam tape, die cutting machine, crease tool, scissors, heat tool. The February Happy Stamping Box class will be held LIVE in the private Facebook group page on Saturday, February 23rd at 9:30am MST. If you can not make the LIVE event the recording will be available after the event in the Facebook group for about 3 weeks after for you to watch at your convenience. You will be added to the Facebook group about 1 week prior to the LIVE class. If we are not currently friends on Facebook please send me a friend request when you sign up for the class (Carrie Cady Rhoades) so I can easily add you to the page. Registration for the February Happy Stamping box is now open and closes on Monday February 4th. Your registration options are listed below with links to register via PayPal. Box includes: 5 project kits, Mermaid Kisses stamp and die set, Peacock Feathers Distress Oxide ink pad, Dusty Concord Distress Oxide ink pad, Ink Blending Tool with 2 sponges, Mini Spritzer, and Glitter Glue. Access to the private Facebook group page, access to the full color PDF to download or print, and a seat at the virtual LIVE class. Box includes: 5 project kits, Peacock Feathers Distress Oxide ink pad, Dusty Concord Distress Oxide ink pad, Ink Blending Tool with 2 sponges, Mini Spritzer, and Glitter Glue. Access to the private Facebook group page, access to the full color PDF to download or print, and a seat at the virtual LIVE class. Box Includes: 5 project kits, Mermaid Kisses stamp and die set, and Glitter Glue. Access to the private Facebook group page, access to the full color PDF to download or print, and a seat at the virtual LIVE class. Box Includes: 5 project kits and Glitter Glue. Access to the private Facebook group page, access to the full color PDF to download or print, and a seat at the virtual LIVE class. 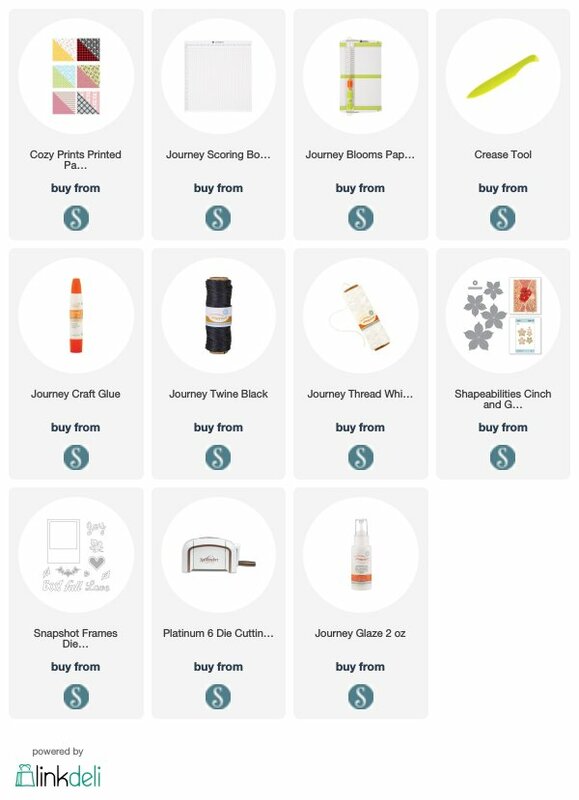 Simply pick the kit that best meets your need and what you already have on hand, let me know if you have any questions, I can help you pick the kit that is right for you. All products for the kits will be ordered and prepared by me after the registration deadline of February 4th. I do not have all the product on hand, it is ordered based on registrations. Class Kits supplies and product ordering, cutting, and kit preparation take 10-12 days after the deadline. The expected shipping date for all the boxes is February 16th. Happy Stamping Boxes can only be mailed with in the United States at this time, send me a special request if you are outside the US at carrie@carriestamps.com. The LIVE class is on Saturday February 23rd at 9:30am MST. The recorded class will be available for viewing immediately after the live class for you to watch at your convenience, for up to 3 weeks. After that time, the video and PDF tutorial will be removed in preparation for the March Happy Stamping Box class. The PDF tutorial will post to the Happy Stamping Box FB page around 2/18/19 for you to print out and use to prepare for and to go along with the LIVE class. Everyone is welcome to join the Happy Stamping Box, new stampers, professional stampers, beginners, etc. Please feel free to share this invitation with a friend. Try out my Happy Stamping Box, I know we will have a blast together making these cute cards. I can not wait to make these amazing backgrounds with you and turn them in to stunning cards! Below are the links to the products I will be using in the class. Again, feel free to use what you have on hand. Or click link below to purchase what you might need. Affiliate links are used at no cost to you, thank you for your support. Since it is the last week of the month I thought I would make this last project with the Let's Toast stamp set a BIG one. Not only is this card a 5" x 7" card, but it is an interactive card, holds a lip balm and has a matching gift with coordinating gift tag. It's almost too much fun for one blog post! I LOVE how this card all came together. I took two colors from the lip balm to create my color palette; Turquoise and Red. I knew I wanted this card to use the Pull Tab add on die set from Lawn Fawn to make my Cinnamon Toast pop up out of the toaster. And I knew I wanted to have the Cinnamon Toast Crunch lip balm right on my card. After a bit of design and redesign this is the finished card. Let me show you the inside of the card, so you can see how the recipient gets the lip balm out of the card. Such a cleaver die set by MFT! You could use this for lots of fun things and I love to have a die that is a tool. With such a large card I did not want to leave the other inside panel plain, so I dressed it up. The scalloped rectangle is the center of the die cut frame from the card front, a fun die set from Lawn Fawn, called Outside In Stitched Scallop Rectangles. I love this card so much, I had way too much fun making it and I might have paraded it around my house for each family member to see. I could not let the fun end there. I needed to dress up my to go cup of Cinnamon Toast Crunch cereal to match. So I made a tag and used my Let's Toast stamps and dies to dress it up. Did you notice the little plug for the toaster??? I used a small piece of black twine for the cord and the pat of butter die for the plug. The prongs on the plug are hand drawn with a black gel pen. And, I have to tell you about the polka dot background on the tag. I die cut two Bread Tag dies, one from Cranberry Bliss card stock and one from Whip Cream Card stock. I then ran the Cranberry tag through my die cut machine using the Lots of Dots die set. This made fun holes into the red tag. I glued this tag to the white one for a fun polka dotted tag. And how about those spoons!!! In my other cereal/lip balm creation I have used plain disposable wooden eating spoons. Well, one of my friends, Cindi Kurtz, found these spoons, with the colored handles and sent them to me! I LOVE them so much and have been waiting for the perfect project to use them with. I stamped the handles with images from the Let's Toast Stamp set and a sentiment from the Sending Smooches set. Look closely and you can see that I stamped a heart on the lips of the smiley face, it's suppose to be a kiss. Who knew cereal could be such a great gift? If you like the Let's Toast stamp and die sets as much as I do you will also love my Let's Toast Tutorial. I have designed 4 WOW cards for this tutorial and show you how to recreate them with a PDF tutorial and exclusive video as well. It is some of my best work with one of my favorite stamp sets. You can get this PDF and Video tutorial for just $5. Click the PayPal button below and I will email you the PDF and link to the video with in 24 hours. Get your Let's Toast Tutorial for just $5! And if you would like to watch the making of the Cinnamon Toast card you can catch last nights LIVE Facebook video below. Below you will find all the products I used to make the card and tag. Please let me know if you have any questions. All the products used are linked below. Affiliate Links have been used at no cost to you. Thank you for your support. Don't you love it when a project in the works gets completed! Today I am sharing my finished letter board. It stared with the Let's Toast stamp set by Lawn Fawn and a banner to go across the top of my Letter Board. I love this set so much it is my January Stamp Set of the month, a set that I pick to feature each Monday night LIVE on my Facebook page. AND, every month I have a PDF tutorial and video featuring 4 WOW projects with the Stamp Set of the Month. The Let's Toast tutorial is available HERE. Now, let's take a look at my completed letter board, decked out with images from the Let's Toast stamp set. To dress up the large open space at the bottom of the Letter Board, I knew I wanted to fill it in with a little scene. I also knew I wanted to add in images from the Thanks A Latte set, also by Lawn Fawn. What I had to figure how it is how I was going to attach these to the letter board. I thought about using the scratchy part of velcro, but was afraid that it make make the felt of the letter board get fuzzy. I knew I was going to have to create something to go on the back of each piece so it would insert into the spaces on the letter board, just at the letters do. So, I took a piece of card stock and created a T shape, it has a flat spot to adhere to the back of an image and a straight piece that fits right into the slits on the letter board. Start with a strip of sturdy card stock that measures: 1/2" x 1-1/2"
Score this at: 1/4", 1/2", 1" and 1-1/4"
Fold the ends in like z shape and glue the two end tabs together, press them down, creating a T shape. You can see what they look like when glued together in the photo above. I show you how to make them in the video below. You can also see the creation of each of the stamped elements. You can see the making of the banner or part 1 of this letter board HERE. If you love the Let's Toast stamp set, you can find it HERE as well at the matching die set and the Thanks A Latte stamp and die set, infact, Scrapbookpal.com is my favorite online store to shop for Lawn Fawn. And, if you LOVE this stamp set, you will also LOVE my Let's Toast Tutorial. This tutorial features 4 WOW cards with the Let's Toast stamp and die set. The cost is just $5 and you get a full color PDF with directions on how to cut and make each card. You also get a link to a private video tutorial with the making of each card. Get your by clicking the link below. Thank you so much for stopping by, please let me know if you have any questions. Welcome back to another FSJ Creative Team Blog Hop! Today I am going to share with you a few projects made using the Gable Favor Box and some of the newly released stamp sets from the Follow Your Heart collection from FSJ. These projects are all very different but have a few things in common, they are all made using the Gable Favor die and they all have a background made with Distress Oxide inks. All these boxes can be used for Valentines treats/gifts or Galentines! Especially this first box, made with the Hey Girl stamp set. This is the perfect gift box for a friend on Valentines Day! These boxes are very easy to put together. I love that they have a good size front panel to add something cute. And are big enough to hold a decent sized treat or gift. I LOVE the background on this box, a technique that I learned by watching a video of Ashely Tucker's. Aren't the clouds so cute! If you keep reading to the bottom of this post I have a video of the making of all three of the boxes in today's post, as well as a list of all the supplies I used. I colored this image in using my Zig Clean Color Real Brush Markers on Bristol Smooth card stock. The second box is for a dog lover, I designed it to have the feel of a dog house. For this box I used the Valentine Pals stamp set by FSJ, also one of their new releases in the Follow Your Heart Collection. And I think it's my favorite! Look how cute that little doggie is! The background on this box was made by layering an ink blended background with a stamped layer over the top, but with a Distress Oxide twist. I love that this box has a little interactive element to it. The door opens to reveal the sentiment. The last box in this series is very unique, in that is combines a galaxy background the Real Gem stamp set. It was inspired by my daughter's love of the tv series Steven Universe. The characters in this show all have a gem attached to them and some of the characters are from other planets. So, this box is one I could gift to my girls and they would LOVE it. But I also feel like it works for any one who loves glam! Isn't it pretty! This background was one of my favorites to make! Speaking of back grounds, all the background panels for the front of the Gable Favor Boxes measure 3-1/8" x 3-1/4", so when mounted to the front of this box you have a nice border all the way around. This box is the only one I made where the background was mounted to another panel of card stock. That layer measures 3-1/4" x 3-3/8", just 1/8" bigger on both sides. I like to write these measurements down on the packaging I keep the die in, so that each time I pull that die out to use it, I have it and do not have to figure out that size again. This background incorporates 4 colors of Distress Oxide inks, water, Whip Cream acrylic paint, and 5 colors of Silk. You will want to watch the video to see it being made. I love the addition of the Trendy Gems with this design, it really makes the whole thing just come together. Below you can watch each of the boxes come together and see how I made them, step by step. In the video I show how to cut out this box using one piece of 8-1/2" x 11" piece of card stock on a large die cutting machine, if you have a standard machine you can also cut this box out with one piece of card stock. Just cut the card stock in half and cut it like described in the video, with the flap hanging off one side about 1/8" of an inch. Now you will want to continue on with the blog hop. Next up is Christine Chan at Love of Sparkles, she is an amazing paper artist! If you get lost along this hop or a link does not work for you, you can also find this blog hop on the FSJ blog HERE. Thank you so much for stopping by, please leave a comment and let me know how you like the blog hop and the projects. Of course I am here to help if you have any questions. Below you will find links to all the products I used to make today's Gable Favor Boxes. Today I am introducing my January Stamp Set of the Month. My pick for stamp set of the month is always a versatile stamp set, meaning a set that I can use for different occasions and projects. It will have images and sentiments in it, most times. And I love a coordinating die set! And what's new about Stamp Set of the Month is now I am offering a Tutorial featuring the stamp set that showcases 4 projects each month! I'll tell you more about that in a minute, first let me show off the stamp set. The January Stamp Set of the Month is the Let's Toast stamp set by Lawn Fawn! I has this adorable toaster and some very fun images to go with it!!! Like this toaster pastry! And this set does have a coordinating die set, there's even a die for the little pat of butter! They also have an add on die set, that creates a pull tab, so you can create an interactive card where the toast pops up out of the toaster! The project I am sharing today is a cute little pocket card. A mini card comes out of the pocket. Aren't the sentiments with this set just perfect! You can watch the making of this card in the video below. If you are in love with this stamp set or maybe you already have this stamp set then you might want my Le't Toast Tutorial. In the tutorial I give you step by step directions and measurements to create 4 WOW projects with the Let's Toast stamp and die set, as well as the add on, Pull Tab die set. The tutorial includes a PDF as well as a link to a private video tutorial. The tutorial is just $5. Click the link below to purchase your Let's Toast Tutorial. I will email you the PDF and video link with in 1 business day. Below you will find all the products I used to make today's card linked, including the Let's Toast Stamp Set, die set and add on Pull Tab die set. Christmas is over and all the fun decorations have been put away. But I wanted to have something cute to hang up during this cold wintery time before the flowers come back. So, I decided to make a snowman to hand up to remind me that snow can be fun and not just a pain to drive in. This is Rosie, as she is made of paper rosettes. I think she is adorable with her pink cheeks and soft hat and matching scarf! I have a complete tutorial for you below as well as a video, to help you create your own rosette snowman. If you make one of these you have to PROMISE me that you will show it to me! I'd love to see your creations! I used the Paper Fan Die by FSJ to make all the rosettes to create Rosie. Here are the paper measurements to create her head. Cut 3 pieces of paper to 2-1/2" x 8-1/2"
Die cut each of these pieces with the Paper Fan Die, taking care to line up the scalloped edge of the die with the edge of the paper each time to ensure that your die cut pieces are all the same. When folding these pieces on the score lines that the die makes you are going to fold it like a paper fan, back and forth, creating peaks and valleys. It is important that you start each piece the same. So, if you start by folding the first one down, then start each piece by folding down. This will ensure that the ends will glue together . Once all three pieces are folded, glue the ends together to make one long piece. Then bring the front and end together and glue them, creating a ring. With the scallops down on your work surface, gather it together and press down, pushing the scallop end out. To secure this put some hot glue on to a 2" circle cut from card stock. Repeat this gathering and pushing, this time pushing it down onto the hot glue. This is the same process you will repeat with the middle and bottom sections of the snowman. You will just start with different size paper, which I have listed for you below each picture. The eyes and the cheeks are die cut circles that are about 3/4". To make one eye I die cut two circles and glued them together to make for a stonier piece. Then I added the white accent with a Geli Roll pen. I did the same for the cheeks but used a pink marker to make the accents. The mouth was created using two nesting circle dies run through a die cutting machine at the same time, cutting a ring. Fold this over on it self and glue it together, this will make a stronger piece. I cut about 1-1/2" off to make for a smaller smile. The carrot nose is simple, just hand draw a carrot shape on to orange card stock and cut it out. But seriously, I know this is not easy for everyone, but give it a try, it does not have to be perfect. All the elements were added to the rosette with hot glue. 3 pieces of paper cut to 3" x 8-1/2"
Die cut each of these using the Paper Fan die and repeat the steps to create a rosette as described above for the head. The buttons are 3/4" circles, each is two layers thick. The holes were punched using the smallest attachment for the Press Punch. To make the buttons shine, I covered them with Journey Glaze. This should be the very last step of this project, as you need to lay it flat so it can dry. 3 pieces of paper cut to 4" x 8-1/2", die cut these pieces with the Paper Fan Die. The snowflake accents were die cut using the Snow Blooms die set. As with all the elements on the snowman, the snowflakes are two layers thick and hot glued on. The sentiment banner is a die cut as well, using the the Journey Rectangle Long die set. The sentiments are from the Winter Scripty Sentiments by Lawn Fawn. I heat embossed them with black powder to give them a shiny look that helps them stand out. And it brings out the black in the hat and scarf. The hat and the scarf are fleece (despite what I say in the video). The hat started as a 10" square. Fold this in thirds and hot glue the seam. Fold up the bottom two times to make the brim or cuff of the hat. Then take a rubber band and wrap it around the top of the hat, about half way down. Snip the ends up to the rubber band to make the cute fringe. Adhere this to the snowman's head before gluing the snowman down to the hanger. The scarf is 5" x 22", but you can really play with this size and make the scarf you want. Fold the scarf in half and snip the ends to fringe both ends at once. Add this to the snowman once the snowman is already glued to the hanger. The hanger is a made of chip board. I save up chipboard pieces from packaging, you could use cardboard as well. Cut two pieces to 1-1/2" x 11". Overlap these at 5" and glue to getter to make a longer piece. You can double up these pieces too if your chipboard is a little flimsy. Then you want to hot glue the ribbon (about 12" ) to the top in a loop for the hanger. Then attached the head with the hat on, then the middle and then bottom. Last steps are to add the scarf and then the glaze to the buttons. Now Rosie is ready to hang up! She is going right here on the door to my craft room. Below is the video demonstration of this project. Please let me know if you have any questions and be sure to share your creation with me if you make one of these snowmen! If you are interested in the supplies I used to make Rosie, scroll to the bottom, I have linked them all for you (except the flannel, which I bought 1/4 of a yard of at Walmart, but I did find something similar on Amazon and linked that). If you would like to see pictures of the Fall Door Hanger, you can find that blog post HERE. Thank you so much for stopping by! I'd love to hear from you, your comments make my day and questions are always welcome! Last year I shared some paper ornaments that I a made with my daughters art class. I called them snowflowers. This year I wanted to make some more and thought it would be fun to make then in different sizes. I started with the original and then made one smaller and one bigger. Let me start by showing you the regular size. 7 strips of printed paper that measure 1/2" x 12", scored at 3" and 7". BUT, I like to score a piece of 12" x12" paper at 3" and 7" and then cut it into 1/2" strips, much easier than scoring seven 1/2" strips. Then I have enough strips to make 3 snowflowers. Each strip gets bent into a petal. The finished flower is about 4-1/2" in diameter. It is hard to explain how you bend and glue them, so I have a video for you on how to make them below. Next up is the smaller version. For the small snowflower you will also need seven strips. These strips are 1/2" x 9" and are scored at 2" and 5". The finished flower is about 3-1/2" in diameter. Again, I started with a piece of printed paper that was 9" x 12" and on the 9" side I scored the entire piece of paper at 2" and 5" and then cut them into half inch strips. You will see how much faster this is in the video. Lastly I have the largest snowflower, where I added a fourth loop to the outside of each petal. This beauty measure just over 5" in diameter. To make it larger you make the 7 petals for the original size and then add another loop to the outside of each that is 1/2" x 6". I added some fun elements to the center of each snowflower. This one has a poinsettia that I made HERE. I also thought I'd help make the ornaments a little more sturdy by adding a small element to the back side. Here I used a small punched circle from coordinating paper. On the others I used a button or rhinestone that matched. Now let's take a look at how to make these ornaments. Thanks for watching and visiting my blog. If you have any questions I'd love to hear from you! Below I have linked all the things I used to make these Snowflowers. Affiliate links have been used at no cost to you. Thank you for your support. I have been having lots of fun playing with my new Glimmer Hot Foil System by Spellbinders. Don't we all just love new things to add to our crafting line up! Well, the Hot Foil system is that new thing for me. It uses heat and pressure to apply a foiled image to paper (or other medias). In today's share I am showing you the basic method of Hot Foiling. But there are several other things you can do and ways to use this machine. For this card I used the Happy Holidays hot foil plate and red foil. The plates for the Hot Foil System look like dies, but they do not cut the paper they press into it. And you can see the crisp shinny image of the "Happy Holidays" looks amazing on this white card front. I found the directions that come with the machine very helpful and when I bought the machine it came with everything I needed to make my first hot foil impression. It comes with a shim, plate, cooling mat, tweezers, two rolls of foil (silver and rose gold), and a set of hot plates. When I purchased my machine I also got a roll of red foil and this Happy Holidays plate. Here you can see the same hot plate used with red foil on pink card stock. I know you'd like to see this machine in action so I am attaching a video of how I made the squirrel card here for you. In the video I share with you my fun new markers the Zig Clean Color Real Brush markers. They are really great! I love how easily they blend. I do recommend watercolor paper for these markers or Bristol Smooth cardstock, for best results. As several of you have asked, here's a link to where I got my set of markers. Note: you can purchase smaller sets than the set of 80 I got. There is a set of 48 markers, HERE. A set of 36 markers, HERE. And a set of 24 Zig markers, HERE. They even have a set of 12 which has a lot of good color and because you can blend these markers you could make a lot of custom colors with this set, see it HERE. Thank you for taking the time to stop and visit my blog. If you have any questions about the hot foil system I am here to help! Or any other questions, just reach out. Below are all the things I used to make these cards. Affiliate links have been used at no cost to you. When I first saw the DIY Hoops from FSJ I knew I was going to have a lot of fun making ornaments. And since I LOVE to make shaker cards I knew I wanted to try to make a shaker ornament with these hoops. To make these shakers you will need two hoops. The ornaments I am making today are with the medium hoops in a package, They measure about 3-1/4" in diameter. I pared the Cozy Prints paper pack with the It's Cold Outside stamp set. All the coloring was done with Color Burst pencils. I added the sentiment to the back of these ornaments so that if they get turned around on the tree there is something else to see. Making these ornaments are easier to make than you might think, but there are a few key steps, so I have a video for you to watch to see how to make them. You can find all the fun things I used to make these ornaments below. The It's Cold Outside is my November stamp set of the month. If you purchase this set through the link above, email me your order number and I will send you an exclusive card kit to make your first card with your new stamp set on me! Thank you for stopping by! Tune in tomorrow to see the gift box I made to put these ornaments in and the matching gift tag. Here's a fun way to gift a Halloween Treat. I wanted to give a NON sugar treat to my class of kids at our Co-Op that I teach at and a Halloween shaker tag makes this candy free gift so darn cute! I used some Halloween Confetti in my shaker. You can find all different kinds online or where halloween crafty things are sold. Another way I like to use confetti is to put in inside a card, so when someone opens the card..... a fun surprise! You will need some thin foam strips to put these tags together, I used this. I had a lot of fun playing with different color combinations for these tags. The tablets and pencils I found at the Target Dollar spot, but also saw them at the Dollar Tree and Walmart. They seemed to be a common item this season. Or, you can use Halloween Sprinkles!! If you'd like to see how I made these shaker tags and how the pencil is attached to the tablet there is a video for you below. Which one is your favorite??? For your convenience I have listed all the supplies used to make these tags for you below. And here's a great pack of Halloween confetti if you want to make some shakers. And this is the amazing hole punch I used, that punches through almost anything, even a penny! If you have any questions about these projects feel free to ask. I love sharing my creations with you! I am excited to bring you the second Blog Hop with the 2018-2019 FSJ Creative team! This month's blog hop is all about Fall! You are going to love hopping along and seeing what my fellow creative team designers have made for you this month. I am going to be sharing with you how to make your own printed paper using Clear Blocks, Stamps, ink, a colored pencil, silk and splash. It's all about layering. First let me share with you a card that I made with the printed paper I created. Then I have step by step directions on how you can make this paper too. First, you will need an 8-1/2" x 11" piece of Whip Cream card stock. If you want to make just a card front size you can, but if I am going to do all of this I like to make an entire sheet, so I can make a few things with it. You will also need 4 sizes of clear blocks, 4 ink pads, small to medium stamps, silk and splashes. Start by inking up the smooth side of your clear block (not the side with the grids). Use this as a stamp to randomly stamp block shapes onto the card stock. Repeat with different size blocks and coordinating colors. The blocks that I used are from FSJ and are currently 20% off. I used blocks; B,C,D,H. I used the True Color Fusion ink pads: Haystack, Tangerine Fusion, Pumpkin Bread and Rich Coral. When the entire sheet of card stock is covered with stamped blocks. Arrange the stamp images you want to use on one medium large block. And stamp this as one image over the top of the blocks. The images I used are from the stamp set, Bountiful Thanks. I stamped them in Cocoa Powder ink. Use a gray colored pencil to add a shadow to each stamped image. I chose to highlight the lower right side of each stamped image with pencil #46 from the Journey Color Burst pencils. The next layer of this DIY background paper is to spray the sheet with Shimmer Gold Splash. I put my paper in a card board box and gave it two sprays. This gives it a very fine mist of gold shimmer. And the very last step is to splatter some color onto the paper, I used Citrus Cooler Silk. Check out the finished DIY printed paper. I then cut this into card front size (3-7/8" x 5-1/8") and created two cards, also with the Bountiful Thanks stamp set. I hope that you have enjoyed seeing the making of this paper and I truly hope you will make some yourself. And if you do will you please show me what you make! I'd love to see your creations! 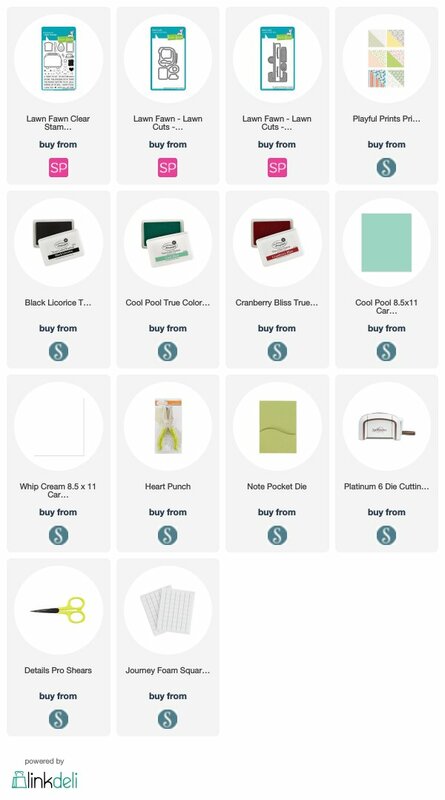 I have listed all the supplies I used to create the printed paper and the cards for you below. Now it is time to hop over and see what my fellow designers have created for this Fall Themed blog hop. Christine Chan is up next at Love of Sparkles. I've also listed the entire blog hop for you below incase you got lost on the hop. Thank you for stopping by and hopping along with us, be sure to visit each blog and leave comments letting the designers know how much you like their projects. From the informal poll I took on my facebook page, your favorite Halloween Candy is Candy Corns. But there are a lot of Reese's lovers out there too! So, I created this cute Candy Corn purse just for you! I love the Eyes on You stamp set, it was the perfect set to dress up my little purse. Don't you just love the sentiment! I made this for the October edition of Coach Collective. A collection of 12 tutorials by 12 different designers. The theme this month is of course Halloween. There are a lot of great ideas that can be adapted to any occasion as well as some fun techniques for cards. Here is a sneak peek at all the projects. I love to give the Coach Collective away to anyone who shops my online store this month. * Be sure to check out the Block Party Sale to get the clear blocks I mount my stamps to at a discount! Or if you'd just like to buy the tutorial you can do so for $15. Here is a link to purchase. I will then email you your PDF tutorial with in 24 hours. Please let me know if you have any questions about this project or the Coach Collective. Time for a quick and easy project. A fun way to dress up a clear bag. It's a little box to put this clear bag (2-1/2" x 2" x 6") with a flat bottom and gusseted sides in. I have dressed mine up for halloween, because I found the cutest Kisses in halloween foil, I had to. Here's how to make this box, be prepared for super easy! Then you snip the sides to make the 4 tabs, that you use to glue this box together. Then you fill up the Clear Bag and it sits in the box snuggly, so it won't easily fall out. To dress mine up I used the dies from the Spooksville set. It's a great set of dies that you can add to most any Halloween stamp set. The sentiment I used is from the Eyes On You stamp set. Want you moon to shine and sparkle? Die cut a circle from Rock Candy card stock. Press it into a Clear Pigment ink pad. Sprinkle it with a mixture of clear embossing powder and Sparkle Dust (I use a 3 to 1 ratio). Heat emboss it and you've got amazing sparkle! You may have seen me use this box on my Haunted House boxes featuring cereal and lip balm, if not here's a link to that post. Thank you for taking the time to stop and visit my blog, I love paper crafting and I love sharing my creations with you. The box I am about to share with is going to be one you make again and again! WHY??? Because it is EASY, takes little paper and it's versatile! Today's box is made to fit a clear gusseted bag with a flat bottom, found HERE. Fill these bags with any treat or fun think you like, set them in this box and decorate the box as you like. For my boxes I went crazy with CEREAL and LIP BALM (again)! When I stumbled upon the Cereal flavored Lip Balms the pack I bought had Frankenberry! Then I saw Frankenberry cereal when grocery shopping and that's when this idea was hatched. If you look closely at the box you will see a haunted house in the upper right corner. So that is what decorated the front of my box with and in the bag went Frankenberry Cereal. The tag holds the lip balm. Cut a piece of card stock to 4-1/2" x 4"
Score on all four sides at 1". Snip on the score line to make four tabs. Glue the box together, fill your Clear Bag with a goody and it fits right in. Then you can decorate the box to dress it up if you like. Like I did here, using the Spooksville Die set. And I couldn't stop there, because not only is there Frankenberry Cereal, there is Count Chocula and BooBerry Cereal. It just so happens that there is also all of these flavors in Lip Balm, thank you Amazon! Lip Balm Sleeve: 2-1/2" x 2-3/4"
On the 2-3/4" side score at 5/8", 1-1/4", 1-7/8", and 2-1/2"
5/8" x 1-7/8" score at 5/8" and 1-1/4"
Use White Liner Tape to adhere the sleeve together and glue dots to attach the bottom piece. These were just so much fun to make! Stay tuned and I will show you what I made with the hershey kisses box in the picture above. Below you can watch the making of the Frankenberry Box. In this video you will notice me cutting small pieces to cover each window. Then a customer of mine, Becky Martin, suggested that I use one big piece to cover the windows. GENIUS! Here's how I did that on my other two houses. After die cutting the house, use the negative piece to trace on to the color of paper you want your windows to be, don't trace all the details, just a rough outline. Cut this out, cutting on the inside of your pencil line and glue it to the back of the house. DONE, I love it, thank you Becky! Thank you for stopping by and letting me share all my fun with crazy cereal lip balm creations. Please let me know if you have any questions. How do you feel about Chalkboard art? I think it is so cool! I'd love to have a chalkboard wall and have a look amazing. BUT, that would require a chalkboard artist, because I have yet to find my chalk drawing abilities. But I wanted a little chalkboard art piece for the little coffee corner in my craft studio. So, I played around with some ideas on how I could make a sign. I then decided I would make a new piece to hang on my Clipboard Easel. I ended up making Chalkboard Paper for this project. It's so easy to get that chalkboard look with only a couple things. I bartered some Black Licorice Acrylic Paint onto my Gel Press to smooth it out. Then I picked up that paint with a piece of Black Licorice card stock cut to 5-1/2" x 8-1/2". I let that dry and then backed it with a piece of light weight chipboard. This created a GREAT chalkboard look. And the chalk writes on it GREAT. However, it does not erase great. So, make sure what you right on it is what you want to stay on it. And, it is easy enough you could make other signs. You could just use a paint brush to apply the Black Licorice Acrylic paint to the card stock, but using the Gel Press and a Brayer eliminate brush stroke lines. And why not just use card stock? Well, the Black Licorice card stock just did not have the perfect chalkboard look on it's own. But the Acrylic paints that FSJ carries have a matte finish and gave me the perfect chalk board look. To add a bit of erased chalk look to my paper I use White PanPastel, smudging it here and there. I the stamped pumpkin image in the upper right corner with Whip Cream ink and it stamped so nicely because of how smooth the paint is on the card stock. For the bottom of my sign I used the Martha's Pumpkins stamp set and the Coffee First die set. And because of this sign I made sure I found some Pumpkin Latte fixings for my Keurig! Now my friends can have a Pumpkin Latte when they come to stamp with me! Want to see the making of my Coffee Bar sign? Check out the video below, it is part of my Stamp Set of the Month series. Each Monday night I do a LIVE video demonstration on my Facebook Page featuring a stamp set, this month it's Martha's Pumpkins. Be sure to click over and follow my page so that you can see what I am going to make tonight. Here's a little hint, my demonstration has to something to do with my trip to Sees Candies!!! Today is also the last day to comment on this post on my facebook page for your chance to win the sign I made during this video, here's a link to the post. All the things I used to make this projects are linked for you below. NOTE 2: All card stock and stamp pads are 20% off at FSJ during the month of September, check out the sale HERE. Thank you for visiting my blog, I'd love to hear from you, feel free to leave a question or comment below. It's one of those projects, friends! One that I will be making time and time again. I am very excited about it. And it all started with chapstick. I came across cereal flavored chapstick while out school clothes shopping with my girls. For some reason I thought it was so fun! I bought a few and thought, I have to figure out something cute to do with these. That lead me to buying some to go cups of cereal that matched the chapsticks I bought. Let's skip to the fun part, here is how I put it all together. I created an easy holder that showcases the cute chapstick. It's so easy too! The tag was die cut using the Bread Tag die and the holder for the chapstick is a small piece of Clear View Sheet that I scored to fit the tube of chapstick. This project was last weeks Facebook Friday project, which means, I have a video for you on how to make it! Check it out below and if you do not already follow me on Facebook you can find me HERE so that you can catch all my videos LIVE when they happen. Clear View Sheet cut to: 2-1/2" x 2-3/4"
Score on the 2-3/4" side at 5/8", 1-1/4", 1-7/8", 2-1/2"
Think of all the fun you can have with this project. There are so many fun chapstick flavors out there! Make this Bread Tag Chapstick Holder to match your flavor and attach it to a gift! It's SO much fun. I will be making more of these so stay tuned! Here are all the products I used to make this, you can find the flavored chapsticks, to go cereal, wooden spoons easily in most large one stop shopping retail stores. I check an all of these items are also on Amazon. If you make a Bread Tag Chapstick holder be sure to share it with me! Thank you for stopping by, I love sharing my creations with you. Please let me know if you have any questions, I'd love to hear from you. *Stock up on 8-1/2" x 11" and 12" x12" card stock and coordinating stamp pads during the month of September, find them 20% HERE. * The September Coach Collective Bundle of Tutorials is bigger this month with a BONUS tutorial inside, see the three ways you can get it HERE. *Did you know you get my Creature Comforts tutorial for FREE when you subscribe to my blog? The September Coach Collective is here! And available for purchase! Here's a little peek at the projects with out giving away all the fun inside. Our theme this month is back to school. You won't believe all the fun things inside this tutorial! Versatile projects that can be used for back to school, but also a inspire projects for other occasions as well. As an added BONUS, this month we have a guest designer, Lael Youngblood, who is on my team and a fabulous designer! That means that this month you are getting the usual 12 tutorials PLUS ONE for FREE! There are 3 ways you can get the Coach Collective of the month. You an purchase the September Coach Collective bundle of 13 tutorials below for just $15. You know you can also get this tutorial bundle for FREE? Each month you shop my online store I send you the Coach Collective bundle for that month as a free gift! You can find my online store HERE. One last way to get the Coach Collective tutorial bundle is to Join my Team, everyone on my team gets the Coach Collective every month FREE of charge. It's one way I support my team with ideas. If you'd like to find out more about being on my team, click HERE. Upon purchase of the tutorial or shopping at my online store I will email you the PDF tutorial bundle with in 24 hours. If you have not yet received emails from me be sure to check your junk/spam folder. If you have any questions about Coach Collective, ordering, or joining my team please feel free to reach out. I'd love to chat with you!